Phi Phi Island residents have only been living on the tropical island for about 60 years. It is amazing to think that such a beautiful island has such a recent settlement history. Even so, Phi Phi Island culture is rich with tradition and heritage unmatched by other societies. The first Phi Phi Island residents arrived between 1945 and 1950. These settlers came from three different areas and cultures. The very first Phi Phi island residents were from Koh Yai, which is right to the north of Phi Phi Island. Immediately following these settlers, came groups from the Krabi and Koh lanta provinces. This gave Phi Phi Island culture a nice blend. To this day, most of the Phi Phi island residents are direct descendants from the first settlers. However, the residents keep close ties with their ancestors to maintain strong Phi Phi island culture. Sea Gypsies are a special clan of the Chao Ley. They are an ancient people that have been coming to the island of Phi Phi Don for as long as anyone can remember. They live on the West coast of Lodalum Bay during the high tide season. In this Phi Phi Island culture, they create temporary housing depending on the tides. During the low season, the Sea Gypsies move over to the east coast to shelter them from the strong westerly winds. These Phi Phi Island residents are filled with culture and ancient history. Their job is not easy. They have small, wooden rowboats they use to row long distances. This is the only way they can catch enough fish to survive. During a cultural ceremony, the community sets their boats adrift in order to bring back prosperity and luck on the sixth and eleventh months. This is always done during a full moon night. There are a of couple different religions that make up the Phi Phi Island culture. There are a few Buddhist Phi Phi Island residents. However, 80% of the population is Muslim. The Sea Gypsies are Muslim and each morning and evening call to prayer from the Mosque. Since the Phi Phi Island residents are mainly Muslim, all of the boat captains are Muslim as well. Phi Phi Island residents are the perfect picture of cultural harmony. There are several different religions and many different cultures that make up the Phi Phi Island residents. After the 2004 tsunami many of the Muslim families returned but many preferred to stay in Krabi or Koh Yao where they had family. 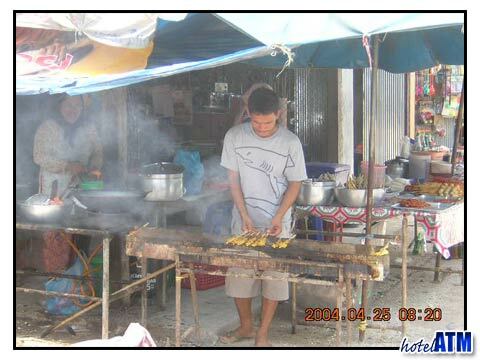 The government built a new village, nick named Tsunami Village up behind Phi Phi Long Beach and some have moved there. However this is village is a 20 minute walk up hill and doesnt have the best location for being part of the community.